So one of my best friends recently moved and her new place was looking rather sparse. Even though it has been months since I’ve crocheted, and though I haven’t been inspired, I mentioned that if she wanted, I could make her a crochet kitchen set to brighten her place up a little. She was thrilled with the idea, and so I started slowly browsing online for something that would match her bubbly personality. Well, for someone who has been completely unmotivated to crochet, this practically flew off my hook! I was done with the potholder within a few hours, and the towel later that evening. The scrubbie I worked up the next day. I could have gone on, too, if I hadn’t run out of yarn (and the turquoise was a mystery cotton, so I couldn’t just go out and easily find another). 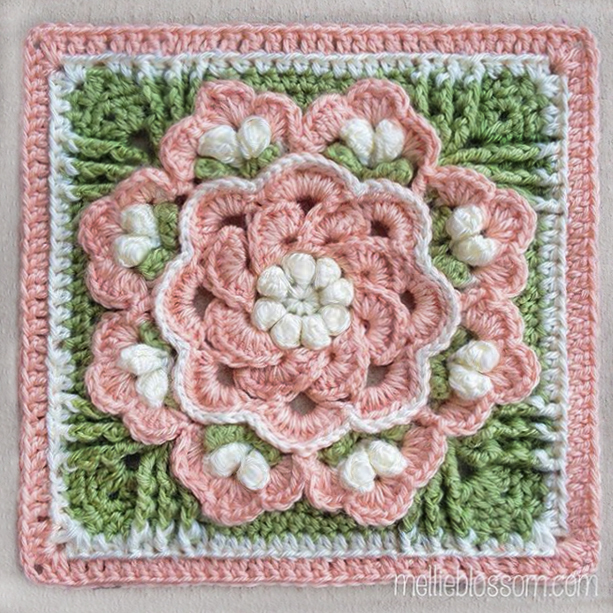 The pattern for the Flower Hot Pad is here, free (from 1946, very vintage-y!). I used a worsted cotton instead of thread yarn, and an H-sized hook. Since that is so much thicker than the light thread that was called for, I didn’t have to put an inner liner in, but I did make up a basic circle backing and sc’d it together to the front. Then I wrapped the yarn around my fingers a couple of times to make a loop and crocheted around that for the hook loop. The scrubbie is another freebie, which unfortunately I forgot to bookmark the page I found it on. It was in Japanese (which I can’t read), so I followed a chart pattern, ended up ripping it out and kind of fudging my way along the second go, making a little change here and there, trying to get it to look like the image in my head. When I looked back through Ravelry to find it (which I still can’t! ), I found this one instead, which is exactly what I was looking for and much easier to follow. I have no idea why I didn’t see that one first. So I’ll point you that way. The hand towel is a very simple pattern I whipped up. It’s just a stripe of hdc. The precise pattern I used was to chain 54, and then hdc all the way across. Change color at the end and then hdc right on back. 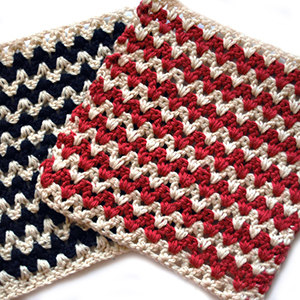 Vary your colors and stripe widths and crochet for as wide as you’d like it to be (mine is 23 stripes). After weaving all the ends in, make a hdc at the end of each row and then turn and make a second row for the border. Easy, simple, and effective! This crochet kitchen set will hopefully be gracing her new home soon. In the meantime, I’m inspired once again to create some beautiful items, maybe even a new crochet kitchen set for my own home. Because, you know, I don’t have enough already! (ha ha.) Enjoy, and have a great Thursday! I have looked for a long time for these kinds of patterns. Thank you so much for sharing your time and expertise with us. Always looking for fast easy patterns. Thanks so much.